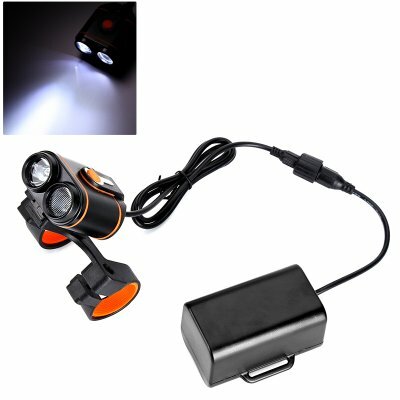 Successfully Added Dual CREE XM-L T6 LED Bike Light Set - 1500 Lumen, Weatherproof, 7 Light Modes, Bright White Light, 4800mAh Battery to your Shopping Cart. Light up the road in front of you and head out after dark with confidence – this Dual CREE bike light set is guaranteed to keep you safe while cycling back home after dark or simply enjoying a late evening bike ride through the countryside. Coming with a front and rear light, this LED bicycle light set is guaranteed to increase your visibility on the road while out in the dark – significantly increasing the safety of yourself and other around you. Capable of illuming 15000 lumen of bright white light, this CREE headlight is guaranteed to light up whatever lies in front of you and provides you with a fully illumined road to ride on. From now on you won’t have to worry about your safety on the road anymore as, with this CREE light set attached to your bike, you will have a clear view of whatever lays in front of you while, at the same time, it informs your surroundings about your presence. Crafted out of high-end aluminum, this head light features an extremely durable design that is guaranteed to withstand the toughest of environments. Not only does this bike light form the perfect addition to your regular bicycle, its weatherproof and durable design furthermore allow you to use it during rough rides such as upcoming mountain bike trips – making it a truly multifunctional headlight that can literally be attached to any sort of bicycle out there. It does not matter whether it gets covered in snow, rain, dust, or mud – this weatherproof bike light is guaranteed to fully function in any weather condition. The powerful head light of this LED bike light set has been equipped with extra-bright CREE LEDs that are guaranteed to illume whatever lays in front of you. Allowing you to set 5 different light modes, this head light is guaranteed to suit your liking and grab the attention of the people in your surroundings. Besides its regular light modes, the front light of this LED bicycle light also features an SOS mode – allowing you to send out bright SOS visuals in the dark in case of an emergency. Packing a massive 4800mAh rechargeable battery, this CREE bike light set brings along countless hours illumination – ensuring that you’ll never be left in the dark while heading out on your bicycle during the upcoming winter months. Coming with a sufficient set of attachment rings and tools – both the front and rear light of this CREE bike light set can be easily attached to any bicycle. From now on you’ll be able to head out at night with confidence as, with this CREE light set attached to your bicycle, you will significantly increase your road safety and will always be able to find your way back home after dark. This Dual CREE LED bike light set comes with a 12 months warranty, brought to you by the leader in electronic devices as well as wholesale electronic gadgets..
Arabic: - مجموعة الدراجة الصمام الخفيفة - Chinese Simplified: - LED 自行车灯组 - Czech: - LED Bike světlo sada - Dutch: - Fiets LED Light Set - French: - Jeu de lumière LED vélo - German: - LED Fahrrad Licht Set - Hebrew: - ערכת תאורה LED אופניים - Hindi: - एलईडी बाइक प्रकाश सेट - Hungarian: - Kerékpár LED fény készlet - Italian: - Bicicletta LED Light Set - Japanese: - LED 自転車ライト セット - Korean: - LED 자전거 빛 세트 - Malay: - Set lampu LED Basikal - Norwegian Bokmål: - LED sykkel lys sett - Romanian: - LED biciclete lumina Set - Russian: - Привело велосипед свет комплект - Spanish: - Sistema luz LED bicicleta - Thai: - ชุดไฟ LED จักรยาน - Turkish: - LED Bisiklet ışık seti - Vietnamese: - Thiết lập ánh sáng đèn LED xe đạp.